Okay, here it is! 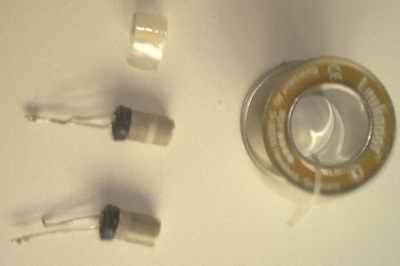 Like promised in "Capacitor mod 1", here the story and the pictures to safely modify an electrolytic capacitor. These are not meant as foolproof, common sense is to be used at all times!! This capacitor modification is really worth the effort, you'll get wagonloads of "push" and detail like you've never heared before.. Please read the following carfully!! At first we make a wooden enclosure for the cap. The diameter of the opening has to be made just big enough to provide a tight fit for the capacitors base (were the leads come out). Then the wooden housing has to be sealed with lacquer. C37 will work very good here, otherwise use lacquer on natural bases. At the right you can see an Elna with plastic and one with plastic removed. When the plastic is removed, take a file and carefully start filing the round top of the aluminum housing. This is best done under a 45 degrees angle. Keep on filing 'till you see a small crack appear, then open up the "lid" of the housing. Carefully remove the top. Now start filing at the side were the negative lead is situated, from leads upward. This is because some capacitors have the negative attached to the housing (BlackGate WKZ have their negative attached to the aluminum, Elna's and FK/VK's don't). Carefully file your way up to the top, again 'till a crack appears. Now you can "fold open" the housing. If the negative is attached to the housing, remove it. Now we clean the capacitor from any metal leftovers from filing. 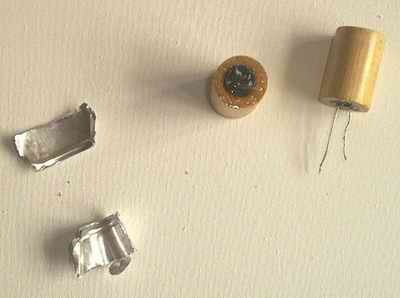 If the housing is totally opened up, the actual capacitor can be taken out. Be careful with this as it is easy to pull the leads apart from the rolled foil... Now we lacquer the base with C37 (not the leads). Then put the capacitor into its new "home". 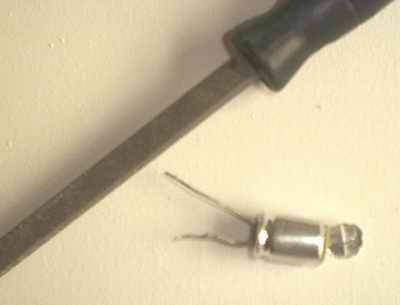 If drilled at the right diameter, the capacitor "just slides in". Put the capacitor in upright position (leads up), and seal the wooden housing with heated paraffin. If you'd like to tweak a little more: sometimes the rolled foil of the capacitor is kept together using a plastic tape: replace this by tape on natural base (in Holland: Leukopor band-aid). In doing this, be careful not to loosen up the rolled foil! 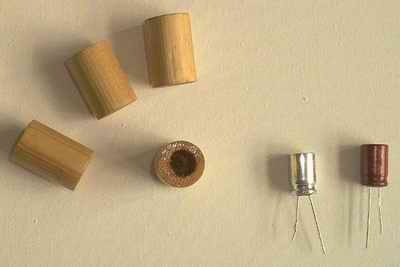 This is were the modified capacitor is born. Measure the cap before using it to see if it is not accidentally shortened! 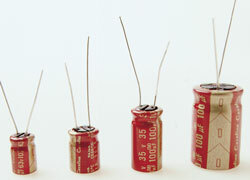 In case you're wondering: These modified capacitors are used for quite a long time now. No sign in drying up or decreasing capacity is measured yet! Ofcourse: This will be at your own risk!! 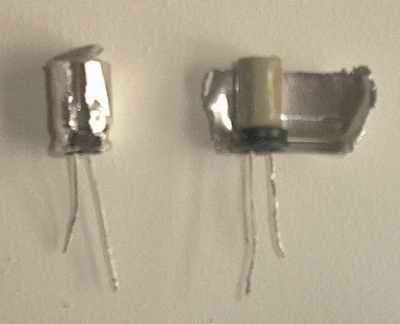 Be careful in filing: in some capacitors the rolled foil is very close to the aluminum housing! The modified Elna Cerafine's have little space in between. BlackGate WKZ's negative is attached to the housing, but a small layer of tar is placed around the foil. As may be clear, this modification is done with high voltage capacitors, an extra word of caution is to be said on this one, for obvious reasons!! Our advice: Practise on -el cheapo- capacitor first, before starting out the "real job"! This is meant as an easy, low cost upgrade, with astonishing results! !